Whether it is summertime or just a sunny spell, getting out and enjoying the outdoors is something every person needs, after having spent the entire inside the house. 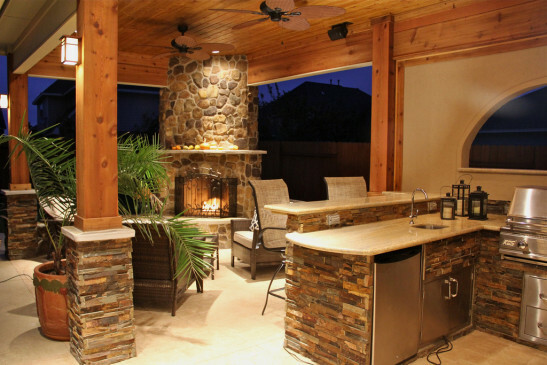 One ways of enjoying the outdoors is by creating an outdoor kitchen and dining area for you and your family and friends. Nothing spells fun like having dinner outside on a beautiful summer night, surrounded by the people you love. Here are several ways you can have this feeling. It all starts with planning and setting up a budget. 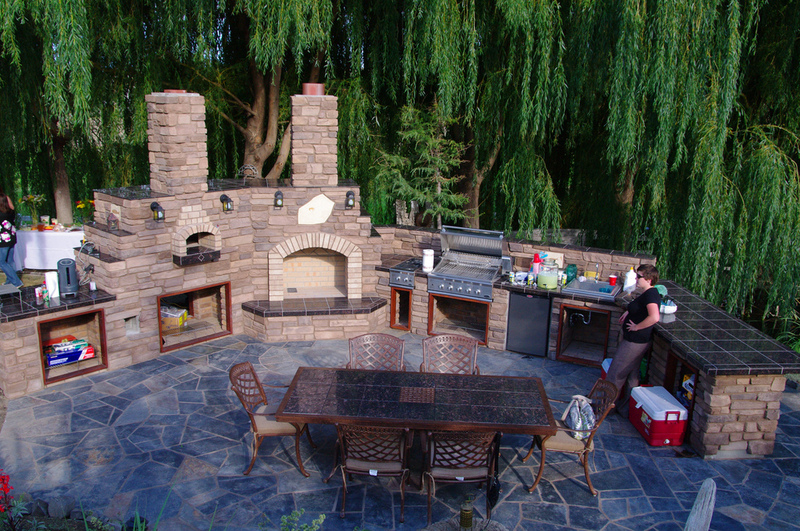 Creating a DIY outdoor kitchen can wary in price from $1,000 to $20,000. The best thing is to start small, by adding a grill and a counter outside. In addition, you could add a sink, refrigerator and a bar area. By knowing exactly what you want, you could set up a budget and stick to it. Keep in mind that besides the money used for buying and building all of this, you will also have to set aside a few dollars for maintenance, which can be a great cost if the kitchen is huge. Define your financial situation and see if this luxury is something you can afford, or you should stick to the simple outdoors dining table next to a grill. 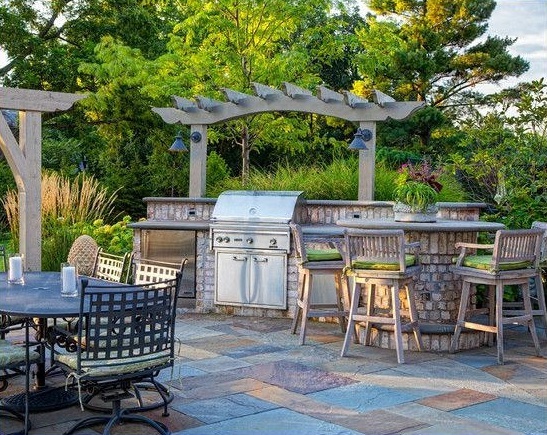 When creating your outdoor kitchen, you have to take into consideration several factors: The weather in your area, humidity and the amount of raindrop per year/season. 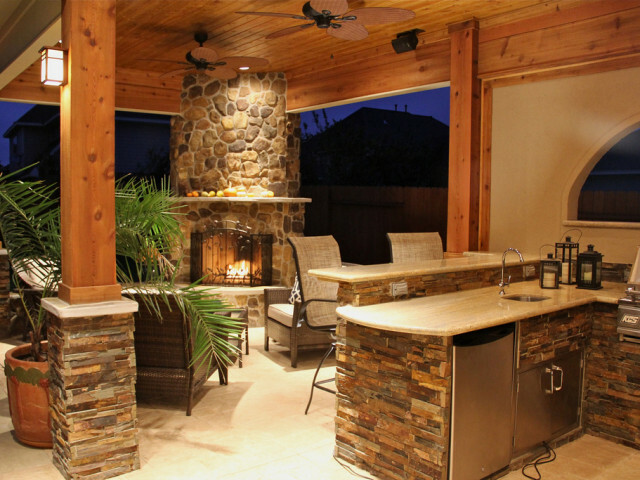 These factors will determine which material best suits your outdoor kitchen. You do not want to spend thousands of dollars on an annual kitchen repairs. Protect your furniture from the elements, and if you are living in a windy area, adding some kind of protective walls that can be retracted is a great solution. If you are looking to establish a fully operating kitchen with more than just a grill, you will need plumbing pipes installed for the sink to function properly. Also, by adding electric wires you’ll make the installation of capital appliances easy. Once you have both running water and electricity, you can add anything you want over time. But, keep in mind that when placing these pipes or running electric wires to your outdoor kitchen, you will have to spend a few dollars in order to get them from your house to the kitchen. Whether you dig up your yard or find another way of doing it, it is going to cost you extra money, so be prepared for it. Relying on natural sunlight alone is not the best idea, for the weathers change and in a glimpse you could be sitting in the dark. By adding overhead lighting, you will ensure that the nights become more pleasant and will not worry about what is going on around you. Attach pendant lamps, recessed cans or anything that will light up the darkness. Be creative if you are looking to create that unique style which all your friends will be jealous to. If you really want to ensure that the area surrounding your outdoor kitchen is dreamy and pleasant, spend extra time carefully designing it and all the details included. There is no ending to all the potential improvements and additions, so as long as you have time to invest and a few bucks to spare, you could end up adding something new or editing something existing. Adding furniture, a fireplace or an entertainment system – these are all the ways to make you feel comfortable. Creating one such kitchen is not a difficult task. If you really want it, you will get it. Simply pay attention to several important details, and ensure that you do everything right and stay within the budget, and before you know it you will be enjoying your dinner in your outdoor kitchen, surrounded by the people you love and the moonlight keeping you company.